When this one came out I had been a Marillion fan for approximately three years, and had already started to prefer the prog classics of the 70's. But it was still inevitable that I would buy the new Marillion album, introducing the new vocalist Steve Hogarth. I'm far from being a puritanist in my relationships with bands: for example I have no trouble enjoying Yes' 90125 - not to mention the excellent Drama - or post-Gabriel Genesis, as they are, without feeling bad that they sound so different from the big classics. So I gave a warm welcome to mr. H. And after all, we still had Fish too: a win-win situation! This new leaf in the band's story tasted fresh. 'The King of Sunset Town' is a great opener that deliciously grows from the quiet instrumental beginning into a solid prog song with pop tendencies. 'Easter' is an emotional, folky ballad which is improved by the more lively final section. The freshness! Then comes the weakest track: I have never enjoyed 'The Uninvited Guest', it sounds nothing but a boring wannabe hit. The title track is fantastic. It has both emotion - approaching sentimento in the underlined environmental message - and the kind of intimate instrumental ambience Marillion was so good at later on (especially on Brave). I love the bright keyboard sounds in it. 'Holloway Girl' and 'Berlin' are rather mediocre tracks that attempt to continue the Fish-era style songwriting including a plot. These songs might work better with Fish on vocals (and in charge of more powerful lyrics, of course). I remember noticing that in the intensive section of 'Berlin' H sounds occasionally like Jim Kerr of Simple Minds. The simple, down-to-earth 'After Me' feels nice - and fresh - at this point of the album. 'Hooks in You' is the catchy hit, quite OK as such but I can live without catchy pop hits. The dramatic closer 'The Space...' is another proggy highlight with 'The King...' and 'Seasons End'. Hogarth's high notes are not always very succesful to me either, but this is definitely one of those Marillion songs I couldn't imagine being done with Fish. Of course with time their style moved further and further away from their original style. 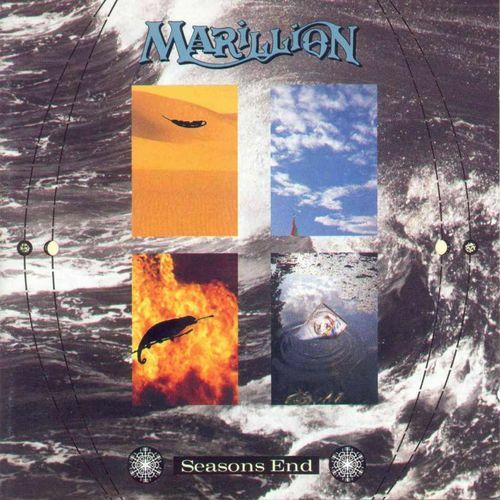 A good start for H-era Marillion, followed at first by a poor, poppy Holidays in Eden, and, through the decades, by a massive discography with a striking uneven-ness. 3½ stars.